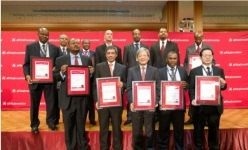 Equity Bank Chief Executive Officer James Mwangi was named Africa’s Innovation Leader of the Year Prize by the African Investor (Ai), a leading international investment and communications group during a World Bank Annual Meeting held in Tokyo, Japan. Mwangi who was recently appointed to the Global Agenda Council on New Economic Thinking (a council of the World Economic Forum) and received an invitation to be a council member at the G8 New Alliance for Food Security and Nutrition, was earlier in the year named the 2012 Ernest and Young World Entrepreneur of the Year. East Africa’s largest bank in asset base, Kenya Commercial Bank (KCB) scooped the African Investor Bank of the Year Award. The multi-million dollar deal struck between Nairobi Java House and Washington D.C-based Emerging Capital Partners (ECP) where the US private equity fund acquired majority stake, bagged the African Investor Deal of the Year Award. Java, co-founded by Kevin Ashley and John Wagner sold 90 percent of its stake to ECP earlier this year in a deal made public but the transacted amount was undisclosed.